Do you have a little athlete at home? After spending the entire summer having to practically pry your child off the couch with a crowbar, it is finally time for them to hit the field, mat, or court again as the school year revs up. As a parent, making sure your child stays protected while they play is one of your top priorities, but between helmets, shin guards, and elbow pads, one part of the body often gets ignored—the teeth! 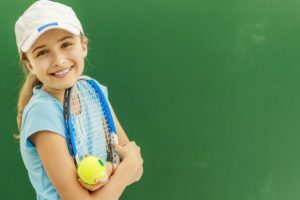 In order to keep your child’s smile healthy and whole as they go for sporting glory, here are a few back to school tips for young athletes from a children’s dentist in Williamsville. Dental injuries like broken and knocked out teeth are extremely common for athletes, no matter their age or level of play. In fact, the American Dental Association estimates that about one-third of all dental injuries are sports related! Thankfully, most can be avoided just by wearing a protective mouthguard. A mouthguard places a barrier in front of the teeth to shield them from unexpected impacts, and it can even protect the cheeks, tongue, and jaw as well. While there are many mouthguards you can pick up from any sporting goods store, the best thing to do is have one custom-made by your child’s dentist. This kind of mouthguard is specially-formed to fit comfortably over your child’s teeth, drastically increasing the chances that it will actually be used! Plus, custom-made mouthguards are typically much stronger and more durable than generic ones, making them a worthy investment (especially if you consider the price of fixing a damaged tooth!). Water can help keep your child hydrated while NOT causing undue harm to their teeth. If you are concerned about them losing out on the electrolytes found in many sports drinks, you can find many brands of water where electrolytes have been added. It is important to note that your child should primarily drink plain, unflavored water, because those with fruit flavors added to them typically contain sugar and quite a bit of acid as well. One of the best things you can do is give your child a durable, refillable water bottle that they will be able to use throughout the season. School is busy for every child, and that is especially true for young athletes. So, the last thing anyone has time for is getting an avoidable dental problem fixed, and these tips will help keep your athlete on the field and their smile healthy from now until next summer. Dr. Stanley Shainbrown is a graduate of SUNY Buffalo and has been serving the families of Williamsville for more than three decades. Over the years, he and his team have helped countless athletes by providing high-quality, custom-made mouthguards, and he is happy to do the same for your child. To start getting a mouthguard for your child so you have one less thing to worry about this school year, he can be contacted through his website.